Okay, so we are now ready to setup your Coinbase account. First, you will need to register. I am going to talk you through this in simple steps, please do not skip any of this as every single thing we do here is of vital importance. Please head over to www.coinbase.com and click on the sign-up button, highlighted on the right. Password: remember to use something random and secure, a collection of numbers, letter and symbols and for now, write this down on a piece of paper and also consider securing it using something like LastPass or Dashlane. As you are typing your password, the page will highlight whether it is too weak, good or excellent. Ensure that your password is random enough to ensure it is excellent. Once you have entered everything above, click on the create account button. Before you can access your account, you will need to confirm your email address. You can do this by accessing the email client where your emails are sent to and clicking on the Verify Email Address button. 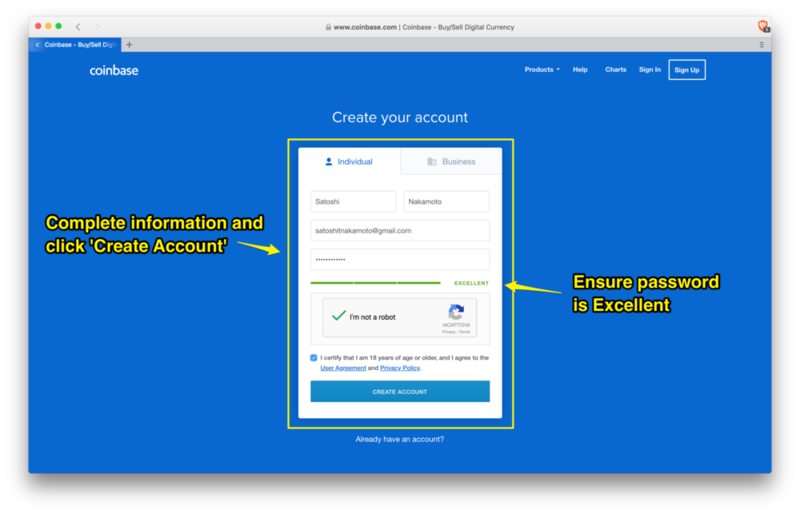 Once your address is confirmed you will now be able to login to your Coinbase account; you can do this by entering the email address and password you chose when you signed up. While there is an option to keep you signed into your account, for good practice, I wouldn't recommend using this feature. As this is the first time you will have accessed your account, you will be required to enter a phone number for security, once you have done this click send code. You should now be logged into Coinbase and you will be able to see your dashboard. Your Coinbase account will be set up with SMS Two-Factor Authentication; we want to switch this to either Google Authenticator or Authy. My preference is Google Authenticator but download either app on your phone, and then follow the additional steps below. Once you have completed this, you will notice on the settings screen that your Two-Factor Authentication method is now set as Authenticator. From now on, every time you log in to the Coinbase website, you will also need to add the authenticator code from your app. Note: you should install your authenticator app on two devices, ideally your phone and a tablet, just in case you lose one of your devices. Therefore, each time you setup Two-Factor Authentication, you should be taking the photo of the RQ code with both devices. Now your Coinbase account is setup, you can move onto Module 3: Lesson 2 and verify your account.